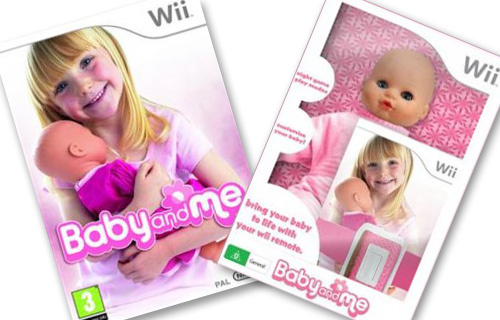 Nov. 2, 2009 Not sure which part of this creeps me out more, the fact that 21st century baby dolls have a Wiimote crammed up the wazoo to ‘bring the baby to life’ as a Wii system accessory, the passive pink gender cues for girls and total absence of boys as video parenting poppas, or the product picture being a dead-ringer look alike of my own offspring at that age. Ewww all around. C’mon Nintendo, I’ll buy that exergames may be giving shut-ins an active alternative to the outdoors, (having seen Wii sports/fitness used successfully in afterschool urban hubs and hospitals, and for casual family fun) but what can you really DO with this thing once you’ve rocked it awhile with full Wii Balance Board support? Wake it? Shake it? Nintendo? Hope you’ll stick your Wiimote product dev team into more exergaming instead of babydolls. Special thanks to Aussie-phile Bill Daul of our NextNow Collaboratory for the hat tip here, and to EW’s PopWatch for the h/t on the video! Oh, and this product will remain in Australia, the special edition has not plans for a U.S. product launch…Learned the marcom lessons of Baby Gluton, eh? Is this for real? Is there actually a game like this in Wii? What would kids benefit from this? I bet, my daughter would actually beg to have it. Oh man! I’m sure it’s pricey! I don’t usually write on blogs but had to on yours. You have a very unique writing style. A lot of people don’t have that touch, they just drone on and on in the most boring way. But not you – thanks! I don’t have time to read everything here right now, I found this site when looking for something else on Google, but I’ve bookmarked your homepage and will check back soon to see the latest articles. My family and I really enjoy playing Wii games together. We have so much fun when we are playing them. It’s really a nice way to spend some quality family time. And I really enjoy playing with on the Wii Fit. That yoga module is so relaxing while at the same giving a nice yoga-based workout. I have a small blog about the Wii. Please take a look at my site at http://www.Wii-Chip.com when you have time and please let me know how you like it. Thanks again for your site – it is really informative.